This peachy white wine sangria will add sizzle to any summertime get-together. The recipe creates a refreshing and quick pitcher-drink that is perfect for small parties. The lovely part about this sangria is that it has a lighter profile than the more traditional recipes—it uses white wine instead of red and features bright fruits like peach, orange, and mango. Adding a little peach schnapps doesn't hurt it's appeal, either. As with any sangria recipe, there are many ways that you can customize it—from the type of wine to the addition of other summer fruits, it's easy to have fun with it. There are no hard and fast rules when it comes to sangria, just as long as you enjoy it and we know you will love this peach sangria with peach schnapps. Pour wine and schnapps into a pitcher and add sliced peaches, orange, and mango. Chill the mixture for at least 1 hour. Add ginger ale or club soda just before serving. If you'd like to serve your sangria right away, use chilled white wine and ginger ale and serve over plenty of ice. You might find that your choice in wine and peach schnapps will affect how much sugar you need to add—a drier wine will require a bit more sugar while a sweeter wine needs less. A good strategy is, to begin with just 1/4 cup of sugar and stir before giving it a taste, then add 1/8 cup (or 2 tablespoons) until it's as sweet as you want it. 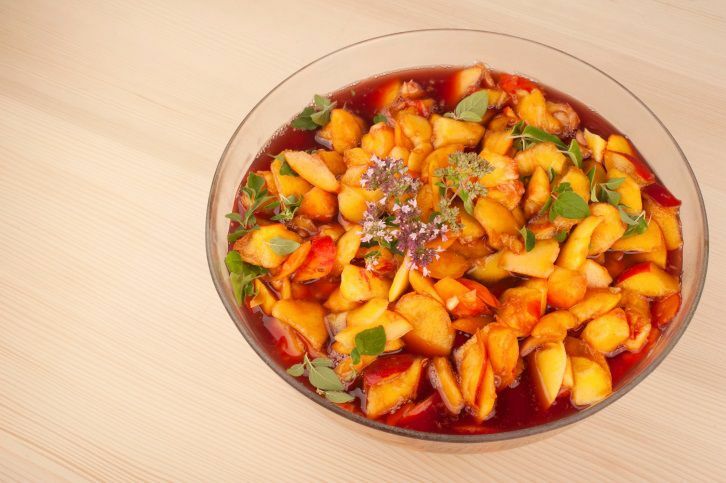 Sangria is all about the fruit you toss into the wine punch. For this recipe, the peaches and orange are necessary, but you can skip the mango if you like (although it does add a really nice touch!). Think about adding other fresh fruits as they come into season. Sliced strawberries, a handful of fresh raspberries, and kiwi slices are all fun additions. You also can add a shot or two of triple sec or a cup of citrus soda if desired. If you are serving this at a party, you can make the sangria look just a little fancier with a simple garnish. Add fresh mint or basil leaves or edible flowers to each glass while serving. There are so many flavors in the just peachy sangria that almost any white wine will do. Grab your favorite bottle and start pouring. It doesn't have to be your best, either—you should not be using expensive wine for sangria! If you need a few ideas, try a Riesling, Pinot Gris, Chardonnay, or Sauvignon Blanc. Each of these is popular and you should have more than enough labels to choose from at the store. Want something a little more exotic? Give an Albarino, Chablis, Gewurztraminer, or Rioja a try.